Complainant’s complaint is uncolorable and confirms beyond doubt the mind of tribunal that the present complaint is filed with no ulterior motive. Therefore, I am bound to conclude with the certainty that the present complaint by the complaint is an effort to save the disputed domain name from misuse and intention to harass or abuse the process of Law. But it is pertinent to mention that if Complainant is convinced within himself that an illegal act of domain name hijacking & cyber squatting has been committed by the Respondent it is abhorring & deplorable that the Complainant has instead of resorting to legal means first resorted to illegal means of buying the domain name by offering payment of money under undue coercion thus rendering the very basis of enactment of law of justice redundant & by becoming an accomplice in an act of illegality has done an illegal act. It is only when the illegal negotiation has not turned out successfully that the Complainant has resorted to legal means of settling the matter by admitting an application for arbitration at NIXI. The law clearly states that the accomplice in an act of crime is also guilty along with the main accused and offerer of bribe is equally guilty of the person receiving the bribe. This tribunal further directs the Complainant to deposit a token sum of Rs.25,000 INR in the registry of NIXI as penalty for being an accomplice in an act of illegality so as to act as a deterrent for all others to being an accomplice/ a party to Criminal offence of offering money to a Cyber Squatter for buying a Domain name. This tribunal also directs the Respondent to pay an amount of 1000 US Dollars to NIXI as punishment and penalty for resorting to illegal means/ cyber squatting and as cost of this proceedings for burdening the administration to fulfill his dirty ulterior motives. In the facts and circumstances of this case this tribunal further directs the registry of NIXI to take adequate precaution in entertaining such complaints and send a copy of this decision to the Hon’ble High Court of Delhi at New Delhi to take further actions against the miscreants as this tribunal cannot go beyond its jurisdiction. 10.The domain name www.youtube.co.nz; www.youtube.in and www.youtube.co.in of the respondent be transferred in the name of the complainant, on completion of all the necessary formalities. The respondent is entitled to the consideration of the NZ$ 8000 as agreed. The award is accordingly passed. 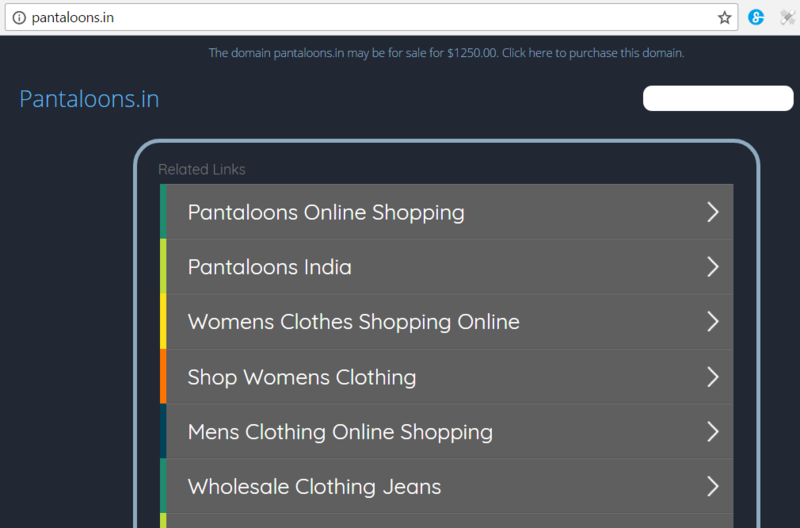 In any case, the www.Pantaloon.in domain name was just held for another one year by the Complainant and very surprisingly, it was dropped in 2010-11. While the new Bangalore-based domain holder had registered in January 2011 on its drop, which is currently parked at www.BODIS.com and has been put up for sale for $1,25,000 !! !